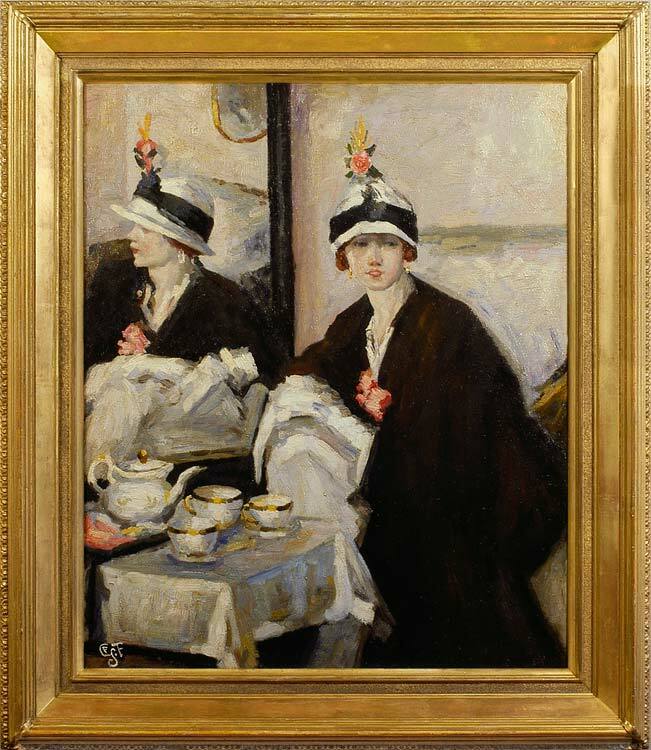 This is a copy of Cadell’s Reflections, painted in a slightly darker and earthier tonality. The brushwork is cross-hatched and built up of choppy strokes, replacing Cadell’s spontaneity and bravura with a more solid realism; the luminous effect achieved in the original by the use of an almost monochromatic palette is replaced by a more colourful impressionism. These indications point to a pupil or perhaps to a family member/friend, who has been set the original to copy as an exercise in composition. It may equally have been copied by an art student in situ at the Kelvingrove Gallery after the latter’s acquisition of the original in 1924. An attractive painting, it is notable for its liveliness of treatment in the model and the still life of the tea service. The monogram with which the work is signed is, like the painting, in the hand of a youthful artist. It appears to be ‘CFSF”, ‘GFF’ or ‘GFSF’. Possibilities (if the artist did become professional) are 1) Geoffrey Scowcroft Fletcher, b. Bolton, fl. 1923, who produced black-&-white drawings, portraits & landscapes, and exh. at the RA and NEAC; and 2) G. Forrester-Scott, fl. 1900-10. Francis Campbell Boileau Cadell (1883-1937), along with Samuel Peploe, Leslie Hunter and J D Fergusson, was one of the Scottish Colourists, active between 1910 and 1930. All worked and/ or were trained in France, Cadell at the Académie Julian; he later visited Munich and then settled in Edinburgh; he, like Peploe, was elected to the Royal Scottish Academy. Cadell worked in both oil and watercolour, producing landscapes, interiors, figure studies and portraits. He is noted for works which, like the present painting, use a looking-glass as a prominent feature of the composition, playing with the reflections produced and the effects on light and space.